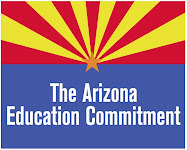 Arizona Education Network: Happy Thanksgiving!!! These are challenging times for our state. And when we're careless with our perspective, our everyday lives are affected, and our ability to find joy in the simple things is compromised. But as we all take a few steps back to gather with loved ones this holiday season, it is important to bank away a reserve; a bit of thanksgiving to carry with us throughout the year for those things big and small. Schools are still open. Minds are still encouraged to learn. Each day promises of yet another child learning to read. And classrooms are full of students dreaming of ways they'll change the world. Another generation awakens a dream of being a teacher some day. Books enlighten curious minds to lands just beyond our grasp. Imaginations climb. Computers connect to Internet portals, uniting our front doors; bring cultures together, promising peace. The world is a classroom with limitless capacity. And we are all welcome to dwell within it. Young and old. These things hold true long after the Thanksgiving holiday has come to pass. And these are the tokens we must tuck away for those days where advocacy is met by prolonged droughts of inspiration and progress. Be thankful this holiday and every day forward. Because for as long as there is a mind eager to learn, there is still so much to be hopeful for.